Rainy days don’t have to mean that you are stuck inside, climbing the four walls! 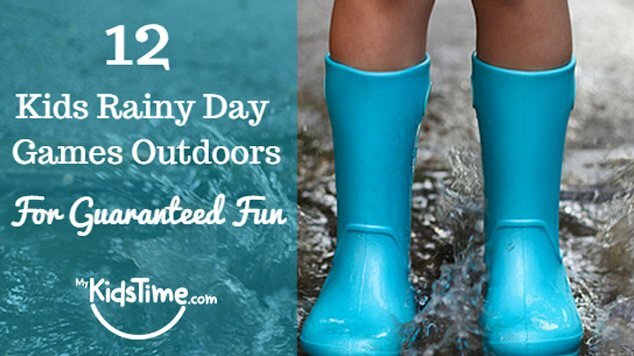 Don the rain gear, and head outside for 12 Kids Rainy Day Games Outdoors for Guaranteed Fun. Just be sure to have a nice warm shower/bath and some hot chocolate ready for the wet explorers! 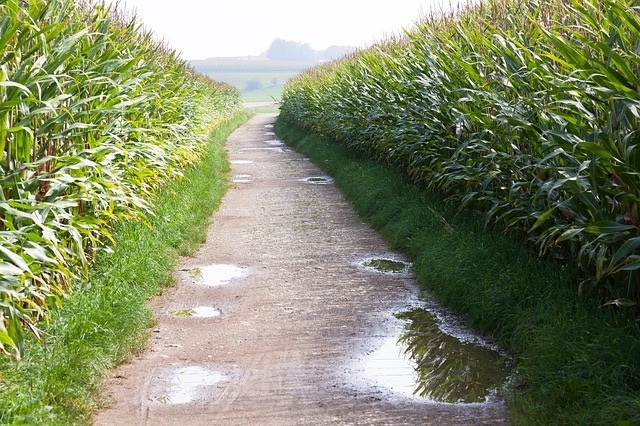 Head out for a walk but make it more fun by getting everyone to jump from puddle to puddle to complete the route. 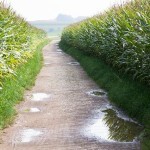 Have a puddle jumping contest – see who can jump in the most puddles. Give each child a bucket and see if they can re-direct the water from trees and downpipes so it flows into their bucket. They have to try and fill it up using only rainwater. You could cut the top and bottom of a plastic bottle to create a pipe to help them with their task. Get your floating boats or toys from the bath and race them in puddles or rivers created along the gutters – see whose toy wins. If you don’t have any floating toys use twigs or leaves and have pooh-stick races. 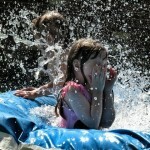 Or race raindrops – each child picks a raindrop on a window and see which one gets to bottom first. 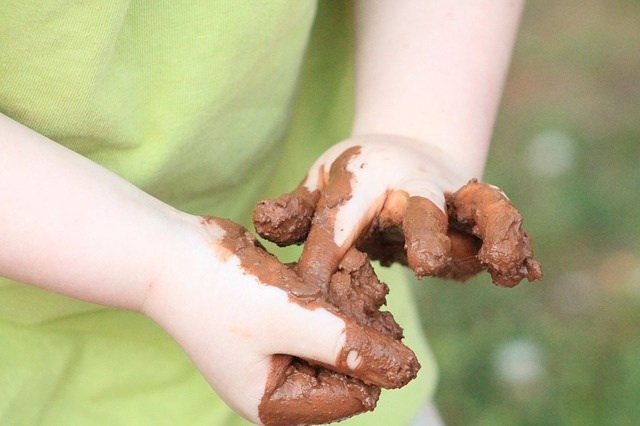 Let the kids have a Mud Town Building Contest. Get old spoons and dishes and cups and help the kids to create a Mud Town or Castle. They could have a moat, mud buildings and use leaves, stones and twigs to create boats, people and shelters. 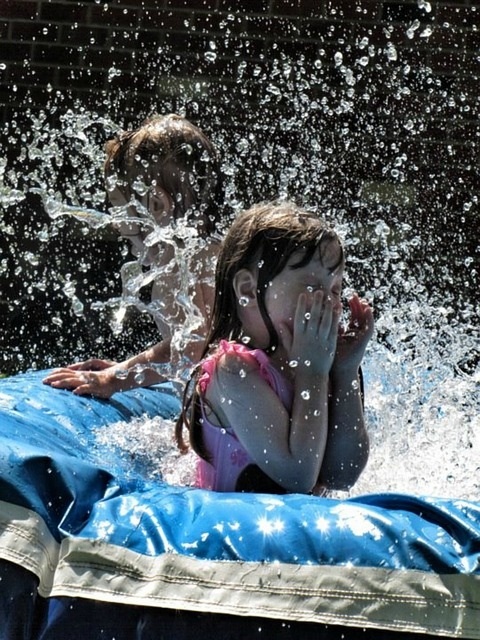 Create a water filled obstacle course. Use slippy grass for skidding and sliding activities. Fill basins with water as a stepping stone obstacle. 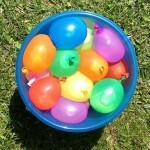 Throw water filled balloons at each other or into a bucket, without bursting! Run the gauntlet of wet sponges, or if you have a water pistol, each person has to run past a line of people throwing or shooting! How wet will you get?! Slugs, snails and worms love wet days. Set up a race track using a piece of cardboard or plastic sheet and catch some slimy creatures to race. Make sure to set them free afterwards. Create a hopscotch grid and get everyone warmed up with a fun game. If it is too wet for chalk, be creative and use twigs to create the grid instead. 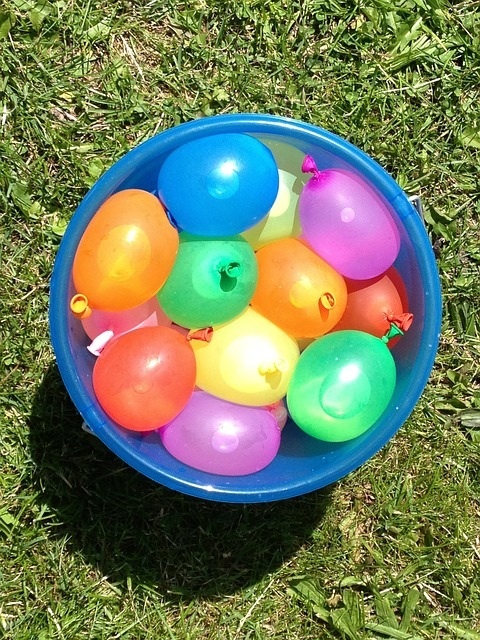 Have a good old fashioned water balloon fight – you’re wet anyhow! Go on you know you want to! Get waterproof containers and fill them with different levels of water. Play your ‘instruments’ using spoons and spatulas to see what each one sounds like. Try and get a beat going and get everyone dancing in the rain. Create your very own bowling alley with part filled plastic bottles and tennis balls as bowling balls. How does the rain change the speed of the ball? Is it easier or more difficult to knock down the bottles? You will need at 4 people to play this fun game. Get 16 balloons and partly fill them with water. Place them in a container between the teams. Have 2 empty buckets at the end of the course (about 15 feet away). 2 players from each team have to stand back to back. Place a water balloon between their backs and they must walk to the finish. If the balloon bursts then it’s back to the start! The winners are the team who transfer the most balloons. Set up a hoop in the garden. If you don’t have a basketball hoop, then string up a hula hoop. Divide into two teams and give each team a wet sponge. They have to shoot the sponge through the hoop. Do you have a favourite outdoor rainy day game? Let us know what it is in the comments below.